Many of the best memories of summer, and even spring during the right weather, involve time spent on the beach or the lake, taking advantage of different watercraft. The term “watercraft” includes sailboats, pontoon boats, motor boats, and jet-skis. However, these happy memories can be forever transformed by a severe accident which occurs while enjoying time on the water. The highest number of boating accidents in Florida occur during the early summer month of May, and the highest number of fatal injuries from boating accidents occur in July. If you have been injured in a boating accident, it is important to speak with a knowledgeable Miami boating accident lawyer as soon as possible. Florida continues to lead the nation with the number of registered watercraft – nearly 900,000 as of 2014, as well as leading the nation in the highest number of boating accidents. Out of this number of boats and watercraft, there were 634 reported boating accidents in 2014, with collisions with other vessels as the leading type of accident. The next highest state, California, only reported 426 boating accidents in 2014. Miami-Dade County reported the highest number of accidents and resulting injuries with nearly 80 accidents and almost 50 injuries. Unfortunately, Miami-Dade County also led the state in numbers of boating accident fatalities, with a reported 10 fatalities out of 73 total throughout the state. The number of boating accidents in 2014 represented a decrease over the last five years in Florida, from the peak of 742 in 2011. The leading cause of fatalities in boating accidents continues to be the result of a boater falling overboard, with drowning being the leading cause of death. The majority of boating accidents occur in the early evening hours, between 4 and 6 PM, with most occurring in the bay or the ocean (as opposed to smaller waterways). Personal watercraft accidents throughout Florida have also been on the rise recently due to a new resurgence in personal watercrafts and the ease with which to both purchase and rent watercraft. In 2014, personal watercraft accidents accounted for approximately 15 percent of all boating accidents, the majority of which involved a collision with another vessel. Pinellas County saw the highest number of personal watercraft accidents in 2014. All of these factors together can lead to severe accidents that have the potential to injure dozens of people both in the water and outside the water. Boating accidents can frequently occur when inexperienced boating operators fail to understand the magnitude of their actions and the impact a large boat can have on other boaters and swimmers. Operator inexperience is the leading cause of boating accidents in Florida, followed closely by lack of a proper “look-out” and operator inattention. Operating a boat or other vessel is similar to driving a car, although in most instances there are far fewer vessels on the water than cars on the road. However, this should serve to force boat operators to be even more diligent, to ensure that they are not missing another vessel on the water. Boats are often much larger and operate at a slower reaction time than motor vehicles on land, and as such can lead to devastating accidents and injuries. Florida requires personal watercraft operators to be at least 14 years old, wear a life jacket, and be able to use an engine cut-off switch. The personal watercraft must only be taken out during daylight hours and operators are prohibited from operating the watercraft in a reckless manner. The refusal to follow the Florida requirements could lead to severe accidents and liability against the negligent watercraft operator. Yamaha introduced the WaveRunner in 1986 to much acclaim, as the first personal watercraft. Since the year of its release, the personal watercraft industry, in general, has skyrocketed and personal watercrafts remain a popular site along lakes and oceans. However, while the popularity of the WaveRunner increased over the years, so did the propensity for accidents, especially those caused by inexperience and the defective design of the WaveRunner. The design of the WaveRunner throttle has led to countless accidents throughout the country. A person new to the WaveRunner and personal watercrafts will often believe that releasing the throttle during a turn will assist with the steering. However, during off throttle conditions, the WaveRunner becomes difficult or impossible to properly steer, leading to severe accidents. While newer models of the WaveRunner have corrected this problem, older models continue to be used and are not intuitive to drive for most personal watercraft operators. Many new watercraft operators will instinctively back off the throttle when turning the watercraft or attempting to avoid a hazard (as is the common method in traditional motor vehicles) when instead, the throttle should remain engaged. The loss of throttle will lead to the total loss of steering, a defect which Yamaha has recognized and has attempted to warn watercraft operators about in their recent owner’s manuals. However, older models continue to cause serious injuries to operators who might not be aware of this problem. In 2011, Yamaha was ordered to pay a settlement fee of $35 million due to a terrible accident caused by the inability to steer the watercraft. In this accident, one teenager lost her life and the other suffered severe injuries when the WaveRunner collided with a boat while attempting to steer away off-throttle. While Yamaha has corrected this error in the manufacturing process, older models of the WaveRunner still exhibit this same issue and inexperienced watercraft operators continue to back off the throttle during turns, leading to the complete loss of steering. While not always considered in the same realm as boating accidents, diving accidents can frequently occur on busy summer weekends when boat operators fail to notice the diver and swimmers in the area they are racing toward. Inexperienced and distracted boat operators are often not paying attention to the potential of individual people in the water and instead are trying to either maintain control of the vessel or are showing off to their friends. Often by the time the operator in this state notices an individual diver or swimmer, it is too late to change course, and the vessel ends up striking the diver head on. This type of impact can have devastating repercussions for the diver, who is likely unprotected in the water. The first jet skis were introduced by Kawasaki in 1973, although they look much different than the popular jet skis today. These early models were a great success and led to an explosion in the newly deemed “personal watercraft.” Jet skis are frequently seen throughout the lakes and beaches of Florida, especially in the summertime. Unfortunately, the improper use of jet skis and operator inexperience while on jet skis can lead to devastating injuries. Florida requires jet ski operators to be over the age of 14, although this requirement does not necessarily curb the number of inexperienced operators on the waterways. Many jet ski operators opt to take their jet ski to extreme speeds and care little about the passing boaters and swimmers around them. At Lipcon & Lipcon, P.A., our Miami boating accident attorneys understand that this lack of safety precautions could cause traumatic accidents that could lead to injuries to both the jet ski operator, passengers, and victims in other watercraft. Many jet ski operators do not own the watercraft and have instead rented it for the weekend. The lack of training and the inability to fully understand the throttle and thrust system could result in serious injuries. The severity of watercraft injuries depends on the circumstances of the accident, as well as the type of watercraft involved. While many people assume they are safe in a larger watercraft, such as a yacht, this does not necessarily protect them in case of a severe impact. However, the smaller the watercraft, the greater the chances of injuries increase if the watercraft accident is a collision. Personal watercrafts offer little protection from the impact of larger vessels, and can, therefore, result in serious injuries or even death to any passengers. The vast majority of personal watercraft accidents involve an impact or collision with another vessel or a fixed object, with half of all accidents stemming from a rented personal watercraft. The amount of compensation you may receive is projected on a case by case basis, and therefore a seasoned Miami boating accident lawyer will be able to better assist you in preparing your claim. Florida is a comparative negligence state, which means that a claim for damages may be reduced by the percentage which a victim is found to be at fault for the accident. If the victim was an operator of another vessel and failed to yield to the negligent boat operator, the victim may be limited to only a percentage of damages. However, an attorney at our Miami personal injury law firm will be able to better assist you with determining the full amount of claims you are entitled to receive. It is important that you refrain from speaking with an insurance company while recovering from your injuries. Insurance companies are in the business of making money, and therefore any settlement offer may not accurately represent the total amount of damages you are entitled to receive after an injury. Insurance companies often do not project out future damages that could impact a victim, given the extent of their injuries. Many victims who have experienced drowning may never fully regain the full mental capacity they had prior to the accident and will be unable to hold a job in the future. A personal injury claim will carefully consider these scenarios when placing a value on the amount of damages. 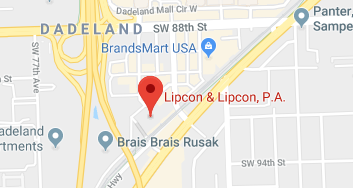 If you or a loved one were injured in a boating accident, do not hesitate to contact the attorneys at Lipcon & Lipcon, P.A. Our lawyers have years of experience in handling boating accident cases and understand the devastation which can follow a boating accident. The average person assumes that boating accidents do not result in severe injuries since they occur in the water. Unfortunately, boating accidents can often become more severe than other accidents and result in terrible injuries that can have a life-threatening impact on the victim. As the victim of a boating accident, you should not be forced to both recover from your accident and cover the tremendous financial burden at the same time. The responsible party should be held liable for any resulting injuries. Contact us today for your free initial consultation.